Game of the Week: #1 Alabama (11-0) at #4 Auburn (10-1). Top-ranked Alabama is an 11-point road favorite in what may be the biggest Iron Bowl of all time. These teams hate each other, and their annual game is, no doubt, the state’s biggest game of the year, and that’s if both teams are winless. This year, they are far winless, holding only 1 loss between them. Both teams have SEC title hopes, and the game will directly decide the winner of the SEC West for the first time since 1994. Both teams also have a good shot at the national championship. Alabama has won 3 of the last 4 national titles, and Auburn won the title in 2010. As for the game itself, Alabama has won 4 out of 5 (Cam Newton was responsible for Auburn’s one win), although Auburn won 6 in a row before that. This is the first ever Iron Bowl with both teams in the top 5, and is the first top 5 matchup at Jordan-Hare Stadium since Auburn tied Tennessee, 26-26, in 1990. Auburn has had a remarkable season, coming back from a 3-9 record a year ago. Alabama, however, has been #1 all year, and is clearly the best team in the nation. They will prove Saturday they are the best team in the state. The game’s hype is warranted, but I think AJ McCarron will improve on his 36-2 mark at QB for the Tide. Alabama 38, Auburn 27. Big Game Guarantee: #6 Clemson (10-1) at #10 South Carolina (9-2). South Carolina is a 5-point favorite at home against their big rivals from the Upstate, the Clemson Tigers. That 5-point number is both appropriate and ironic, as the Gamecocks are trying to win 5 in a row against the Tigers, a feat the program has never accomplished (the closest they’ve come is winning 5 out of 6 from 1949-1954, and tying the 1950 meeting). Clemson coach Dabo Swinney realized the importance of breaking Gamecocks’ win streak, saying “We’ve got to win the dang game.” Clemson’s only loss all year is to #2 Florida State, although that game was not close (then again, nobody has played the Seminoles close). Clemson will play this game on the road, and their toughest road games so far have been against Syracuse and Maryland, a far cry from playing a top 10 team on the road. South Carolina has losses to Georgia and Tennessee this season. While the Georgia loss was understandable, as that game was played in Athens before Georgia was hit with their injury issues, the Tennessee loss is a head-scratcher. Even still, the Gamecocks sit in the top 10 and still have a chance of playing in the SEC title game. This may be the biggest matchup ever in this rivalry, as the winner may wind up with a BCS at-large bid, and the loser will eliminate themselves from BCS contention. I think home-field advantage may be the difference here, with Clemson’s lack of big-game road experience and South Carolina’s good play all year at home. South Carolina 28, Clemson 27. Another Big Game Guarantee: #21 Texas A&M (8-3) at #5 Missouri (10-1). Missouri is a 4-point favorite at home in one of their biggest games in program history. Their SEC East clinch scenario is simple: if they beat Texas A&M, they win the East, and if they lose to the Aggies, South Carolina wins the East. Missouri is “undefeated in regulation”, as they say, with their only loss coming to South Carolina in double overtime. Texas A&M, after coming into the season with national title hopes, has close losses to Alabama and Auburn, and a blowout loss last week at LSU. QB Johnny Manziel may have knocked himself out of Heisman contention with a poor performance last Saturday, but he will still be a big factor in this game. Missouri QB James Franklin played well last week against Ole Miss in his return from a shoulder injury. Missouri has home-field advantage, and is 3-1 on the year against ranked opponents, while Texas A&M is 0-3. Missouri 42, Texas A&M 35. Another “Big Game” Guarantee: #3 Ohio State (11-0) at Michigan(7-4). Michigan has the “Big Game” with Ohio State at home in Ann Arbor this year, but they are 15-point underdogs to the undefeated Buckeyes. Urban Meyer is 23-0 as Ohio State’s head coach, while Michigan’s Brady Hoke is on the hot seat after losing to Iowa to drop to 7-4, losing 4 out of 6. Michigan leads the all-time series 58-44-6, but Ohio State has won 8 out of the last 9. Michigan’s lone win over that span was 2 years ago, in the last meeting in Ann Arbor. While some of those Buckeye wins have been close, such as the “Game of the Century” in 2006, some of them have also been blowouts. I think this game will be somewhere in the middle. Ohio State is lagging behind the other 2 major undefeated teams in the rankings due to a weaker schedule and closer scores, but they continue to win. Michigan has a lot of talent on their roster, but isn’t playing well. While I think Michigan will play better, Ohio State will be too much. Ohio State 35, Michigan 20. Upset of the Week: #24 Duke (9-2) at North Carolina (6-5). When you think of Duke and North Carolina, you think of their battles on the basketball court. However, Duke is ranked for the first time in the BCS era, and North Carolina has struggled at times this year before getting bowl eligible last week. Duke is playing for the ACC Coastal division title, after winning 7 straight. And somehow, the odds makers are favoring North Carolina by 6. The Heels do have the benefit of a home game, although Duke only has to travel 15 miles from Durham to Chapel Hill. During Duke’s winning streak, they only have 1 blowout win, winning the rest with big defensive stops, often pulling away late. The Tar Heels scored 80 last week against Old Dominion, and have a 5-game winning streak of their own. The Heels have won 21 out of 23 against Duke, including 10 out of 11 in Chapel Hill, although Duke won last year in Durham on touchdown with 13 seconds left. I still don’t understand how North Carolina is favored here, even if they are playing what is easily their best football of the year. Duke’s wins haven’t been flashy, but they’ve done what they had to in order to win, and I believe they will again. This is quite a matchup for the 100th meeting in this rivalry, one that can continue off the basketball floor. Duke 27, North Carolina 24. Closer than the Experts Think: #25 Notre Dame (8-3) at #8 Stanford (9-2). Stanford is a 14-point favorite over Notre Dame. Stanford clinched the Pac-12 North last week with a win over Cal and Oregon’s loss to Arizona. The Cardinal have an impressive list of wins over ranked teams, although they also have losses to Utah and USC. Notre Dame has played a tough schedule, as usual, with losses to Michigan, Oklahoma, and Pittsburgh. Stanford has won 3 out of 4 in the series, although Notre Dame won a very controversial game in South Bend a year ago, in overtime. Notre Dame coach Brian Kelly says he expects the game to come down to inches again this year, even though his team is an underdog. It is certainly possible Stanford could get caught looking ahead to the Pac-12 Championship game next week, a game that will have a much bigger bearing on their BCS bowl chances. In the end, I think this game will be closer than the spread, simply because I think there won’t be a whole lot of offense. Stanford 17, Notre Dame 10. Bonus: NFL Pick: Denver Broncos (9-2) at Kansas City Chiefs (9-2). Denver is a 5-point favorite, coming off a shocking loss to the New England Patriots in which they blew a 24-point halftime lead and lost in overtime. Kansas City is coming off a loss of their own, a 41-38 defeat at the hands of the San Diego Chargers. While both teams are coming off losses, these teams are still playing for first place in the AFC. When these teams played 2 weeks ago in Denver, the Broncos won 27-17. The Chiefs do usually play better at home, although that loss to the Chargers was at Arrowhead. For the Chiefs defense, they will likely have to play the game without sack leaders Justin Houston and Tamba Hali. That will make the game a little easier for Peyton Manning, which is all the Broncos need. I still expect the game to close, since it’s in Kansas City, where the Chiefs play well, and both Broncos losses this year have been on the road. Broncos 24, Chiefs 23. Bonus: NFL Pick: New Orleans Saints (9-2) at Seattle Seahawks (10-1). The Seahawks are 5 point favorites at home in this game, which is for first place in the NFC. ESPN is licking their chops at the biggest Monday Night Football game in years. The Seahawks have a NFL-best 13-game home winning streak, and everyone knows CenturyLink Field may be the toughest venue for opponents to win in all the NFL. That’s especially true when the Seahawks are one of the league’s 2 or 3 best teams, as they are this year. The last meeting of these two teams was in the Divisional Round of the 2010-11 playoffs, and is remembered for Marshawn Lynch breaking at least 7 tackles on a touchdown run that put the game out of reach in favor of Seattle. New Orleans is 3-2 on the road, with losses to the Patriots and the Jets. In addition, the Saints are just 1-4 against the spread in road games. Since they’re underdogs here, they will have to beat the spread to have any chance to win, but even that may be problematic. Seahawks 38, Saints 28. Happy Thanksgiving; enjoy your families and your football! 1. Alabama (11-0). The Crimson Tide defeated FCS opponent Chattanooga 49-0 on Saturday, setting up an Iron Bowl for the ages against Auburn. After allowing just 7 last week to Mississippi State, the shutout of Chattanooga means the Tide now have the nation’s best scoring defense, allowing just 9.3 points per game. That number would be even better without a 49-42 win against Texas A&M in September. This week, as mentioned, the Tide will travel to Jordan-Hare Stadium for a huge game with Auburn, not only for in-state bragging rights, but also for the SEC West division title. If Alabama wins, they will still have to win the SEC title game against either Missouri or South Carolina. The Tide still have some work to do just to play in the national title game, much less to win it. 2. Florida State (11-0). The Seminoles demolished the Idaho Vandals on Saturday, by a 80-14 score, as they continue to steamroll their competition. This week, they will travel to Gainesville, usually a tough place for any opponent to play. This year is the exception, however, as Florida has struggled to a 4-7 record, including a loss on Saturday to Georgia Southern of the FCS. While the Seminoles’ undefeated record is at stake against Florida, as it is in any game they play, they will play in the ACC Championship Game on December 7, regardless, against likely Duke or Virginia Tech (although 4 teams still have a chance in the ACC Coastal). I would be shocked if they lost either of these 2 games to fall out of national title contention. 3. Ohio State (11-0). The Buckeyes defeated the Indiana Hoosiers by a 42-14 score on Saturday to remain unbeaten. Looking back on their schedule thus far, there is a touch of irony in the fact that their closest game was against Northwestern, who led much of the October 5 contest but hasn’t won since, now falling to 0-7 in Big Ten play. Ohio State will play their big rivalry game with Michigan this week, and although they are favored by 15, many see the Wolverines as a potential threat to the Buckeyes’ perfect season. Regardless of their outcome against Michigan, they will then have to play a tough Michigan State team in the Big Ten Championship Game. While the Buckeyes will be fans of the opponents of Alabama and Florida State, they will have to play well the next 2 weeks for the national title game to even be an option. 4. Auburn (10-1). Auburn comes off of a bye, still basking in the glory of their miraculous victory against Georgia. Now they will host top-ranked Alabama. This game will be the first time since 1994 that the two have played with the winner earning the trip to Atlanta. Auburn has had a fantastic turnaround after a 3-9 season last year in which they failed to win an SEC game, with their only loss coming early in the year at LSU. Honestly, I think if Auburn played LSU again today, Auburn would probably win, as they have improved throughout the season. That being said, they will obviously face their toughest test this week against Alabama. 5. Clemson (10-1). The Tigers defeated The Citadel, 52-6, in their final tune-up for their big rivalry game against South Carolina this Saturday. The outcome of that game may be determined by which Clemson team shows up. Will it be the team that beat Georgia, and that won ACC conference games by scores of 56-7, 49-14, 59-10, and 55-31? Or will it be the one squeaked over mediocre opponents by scores of 26-14, 24-14, and 40-27, and lost by 37 to Florida State? The fact that Clemson’s only loss is to Florida State helps their ranking out, although their toughest road games thus far have been Syracuse and Maryland, and this week they’ll play a top 10 opponent on the road. 6. Missouri (10-1). The Tigers survived a road test on Saturday, spoiling one of my upset picks with a 24-10 win at Ole Miss. Now Missouri stands a win away from their first SEC East division title, in just their second season in the league. If they want that title, however, they’ll have to earn it, as their final regular season contest is against Texas A&M. This will be the 5th ranked team Missouri has played, although 3 of the first 4 have fallen from the rankings after losses to the Tigers (Georgia, Florida, Ole Miss). The remaining ranked team they have played is South Carolina, who beat the Tigers in double overtime, 27-24. 7. Oklahoma State (10-1). The Cowboys made a statement on Saturday night, beating previously undefeated Baylor, 49-17, to move into first place in the Big 12. They have now beaten ranked opponents in 3 of their last 4 games, all in blowout fashion. Earlier in the season, the Cowboys lost to West Virginia, and had a close call at home against Kansas State. Since, they’ve won convincingly against each of their opponents, showing that right now they are playing as well as just about anybody. This week they have a bye, and can rest over the holiday weekend, before hosting Oklahoma next week in the “Bedlam” rivalry game. If the Cowboys win that game, they will clinch a BCS bowl berth. While most focus their attention on the Cowboys’ offense, which ranks 13th in points scored, their defense is even better, ranking 11th in points allowed per game. 8. Stanford (9-2). The Cardinal won “The Big Game” Saturday against Cal, 63-13, and clinched the Pac-12 North when Oregon was shocked by Arizona. This week, the Cardinal will play their 6th ranked opponent of the season, having beaten the previous 5. While that gives them quite an impressive résumé, they also have 2 losses to unranked opponents, Utah and USC (although USC has since become ranked). While their big game as far as bowl placement will be played in the Pac-12 Championship next week (against Arizona State, in Tempe if ASU beats Arizona, and in Palo Alto if ASU loses to Arizona), they do have a big non-conference contest this week against 25th-ranked Notre Dame. While the game won’t affect their Rose Bowl chances, it will affect their top 10 ranking. 9. Baylor (9-1). Baylor’s national title chances ended on Saturday night with a bad loss at Oklahoma State. In that game, the Bears scored just 17, a season low, and allowed 49, a season high. While the Bears goal for much of the season had been to compete for and even to win a national title, they still have a lot to play for. In the event that Oklahoma State loses to Oklahoma, Baylor can win out in their games against TCU and Texas to win the Big 12 title. Even if Oklahoma State does win the Big 12, there is still a possibility, if Baylor wins out, of the Bears being invited to a BCS bowl game, or at least the Cotton Bowl. First at hand is the game with TCU, which is on the road for the Bears this Saturday. 10. South Carolina (9-2). South Carolina badly beat a good FCS school in Coastal Carolina, 70-10, in their final game before their big rivalry game with Clemson this week. The Gamecocks season goals most years are to win the SEC East, beat Clemson, and possibly contend for a national title. While losses to Georgia and Tennessee ruined their national title chances, the other two options come down to the final day of the regular season. Naturally, the big goal this week in Columbia is to beat Clemson, as the Gamecocks directly control that based on how they play against the Tigers on Saturday night. But in addition, there will be a little bit of scoreboard watching, because if Missouri loses to Texas A&M, that goal of winning the SEC East will become reality. Also Considered: Michigan State (10-1), Oregon (9-2), Northern Illinois (11-0), Fresno State (10-0), Arizona State (9-2), Wisconsin (9-2), UCF (9-1), Louisville (10-1), LSU (8-3), Oklahoma (9-2), Duke (9-2). We’re a little over two weeks into college basketball season, and while no ACC conference games have been played, there have been some meaningful games and upsets over the last 17 days. I plan to write these power rankings every other week from now until the beginning of conference play, and every week once the “real season” starts in January. Here are the updated power rankings. 1. Duke (4-1). This was a tough call between #1 and #2, since Syracuse is undefeated. Duke’s loss, however, is to an exceptional Kansas team, who I don’t see losing to anyone in the ACC (at least not right now). Duke did struggle this week with East Carolina and Vermont, but they came away with wins, so I’ve left them at #1 for now. 2. Syracuse (4-0). It still feels odd to say Syracuse is the 2nd-best team in the ACC. Regardless, they have looked pretty good in 3 of their 4 wins, winning against Cornell, Fordham, and Colgate by comfortable margins, although their game against St. Francis (NY), who had previously beaten Miami, caused a little bit of a scare, before the Orange eventually won by 6. The Orange are in Hawaii this week for the Maui Invitational. 3. North Carolina (4-1). The Tar Heels have already proven that while they have a load of talent, perhaps they lack some consistency. After a blowout win over Oakland, the Heels beat Holy Cross by just 8, and lost to Belmont at home. In a tournament over the weekend, they struggled against Richmond before winning by 10, then popped up and beat #3 Louisville by 9. A date with #1 Michigan State is lurking next week when the ACC-Big Ten Challenge comes around. 4. Pittsburgh (4-0). You could make a case Pitt should have been higher, as they are one of 3 undefeated teams left in the ACC, and are the lone team out of the 3 who haven’t had a scare in their early season matchups. The reason they remain in their preseason slot at 4th is because the best team they’ve played is Lehigh. That will change when they play Texas Tech tonight. 5. Virginia (4-1). The Cavaliers were 1 of 4 ACC teams who were ranked in the AP preseason poll. While they have fallen out of the rankings after a close loss to then 14th-ranked VCU, they’ve taken care of business against the rest of their competition to uphold their good standing in the conversation of the ACC’s elite. 6. Florida State (5-1). The Seminoles jump from 12th in my preseason rankings to 6th based on their performance in the Puerto Rico Tip-Off. In the tournament’s opening round, the ‘Noles defeated 10th-ranked VCU, before losing in overtime to #14 Michigan (who went to the national title game last year), and defeating Northeastern to finish 3rd in the tournament. FSU will face another test Friday at #15 Florida, before traveling to Minnesota next week. 7. Notre Dame (4-1). The Irish have taken care of business in 4 of their 5 games, easily defeating their opponents. In their other contest, however, the Irish lost to Indiana State by 13. Interestingly, Indiana State’s only loss is to the same Belmont team that beat North Carolina. The Irish have an easier schedule until late December, when they will play Indiana and Ohio State back-to-back. 8. Maryland (3-2). In Maryland’s 3 wins, they have easily triumphed over their competition, with a medium-quality win coming against Northern Iowa. Their 2 losses aren’t terrible, with one coming on opening night to UConn after a furious comeback to make the game close, and the other coming by 7 to Oregon State, at home in College Park. The Terrapins final appearance in the ACC-Big Ten Challenge (on the ACC side, anyway) will have them facing future conference rival Ohio State in Columbus, next week. 9. Clemson (5-1). The Tigers jump from 14th to 9th due to a surprisingly good stretch of basketball. Over their first 6 games, they’ve held each opponent to 62 or less (in their wins, its 58 or less), while scoring 71 or more in 4 of their 6 games. The wins include in-state rival South Carolina, SoCon power Davidson, and 2013 NCAA tournament team Temple, all without much drama. The lone loss came by just 6 to a good, undefeated UMass team, who in today’s AP poll were ranked 24th. 10. Georgia Tech (4-1). Georgia Tech has beaten who they should beat so far, including a win over in-state rival Georgia by 9, while losing to an undefeated Dayton team out of the Atlantic-10 conference. This week they will play Ole Miss in the Barclays Classic in Brooklyn, before hosting Illinois next week during the ACC-Big Ten Challenge. 11. Wake Forest (5-0). The Demon Deacons are undefeated thus far, but stay in 11th in my rankings because of who they’ve played. Their toughest tests yet came from Jacksonville and Colgate, who both played tight games with Wake before the Deacs pulled away late. That undefeated record is, to be subtle, on the line, when Wake Forest travels to The Bahamas for the Battle 4 Atlantis tournament, and plays Kansas in their tournament opener. After the game against the Jayhawks, win or lose, they will play the remainder of the tournament against a tough field. 12. Miami (3-2). Miami drops 3 spots due to their early struggles this season. While the Hurricanes are defending ACC champions (both regular season and tournament), they are clearly hurting from the loss of the top 6 scorers from that team. The season began with an overtime loss to St. Francis (NY). Georgia Southern also took them to overtime 3 days later, although the ‘Canes pulled that one out. While Miami has since won comfortably over Texas Southern and College of Charleston, they lost last Thursday to Central Florida. This week the Hurricanes will play in the Wooden Legacy in Charleston, SC, beginning with a battle with George Washington on Thursday. 13. NC State (2-2). Like Miami, NC State lost all 5 starters from last year, and their young team is struggling to find success. While the Wolfpack have comfortably defeated Appalachian State and Campbell, and lost at Cincinnati, the low point of the young season surely came last Wednesday. NC State lost to NC Central, in a game that went to overtime. The extra session was dominated by the Eagles, who won by 10. Tomorrow, the Wolfpack face another test, when last year’s Cinderella team, Florida Gulf Coast, comes to Raleigh. 14. Boston College (2-4). The Eagles of Chestnut Hill are definitely the ACC’s biggest surprise so far. Myself, as well as other analysts, projected a much better year for Boston College, with all 5 starters back. Instead, Steve Donahue’s squad has struggled to beat their non-conference opponents. First, they lost to Providence in overtime, followed by a 13-point loss to UMass and a 3-point loss to Toledo. After they got off the schneid with a 3-point win against Florida Atlantic, they lost to UConn and defeated Washington at the 2K Sports Classic in New York. 15. Virginia Tech (3-3). Virginia Tech can make a case that they should be above Boston College. After starting the season with a stunning loss to USC Upstate by 1, they beat West Virginia by 5, and Western Carolina and VMI by wide margins. In the Coaches vs. Cancer Classic, the Hokies hung around #1 Michigan State in the first half, before losing by 19, and lost by 1 to Seton Hall. With the exception of a home game against VCU, the Hokies have an easier schedule leading into conference play. Their fans need to enjoy the wins they can get now, because they will be hard to come by later. Game of the Week: #4 Baylor (9-0) at #10 Oklahoma State (9-1). Baylor is favored on the road by 10 in the Big 12’s biggest game all year. Whoever wins between the Bears and Cowboys can win out to win the Big 12 and receive its automatic BCS berth. Baylor’s offense continues to lead the nation by a wide margin. Oklahoma State’s offense, however, ranks 14th nationally. While Baylor is undefeated, Oklahoma State’s only loss was back in September, to West Virginia. While both offenses rank well, both defenses are also in the top 15 in the nation. However, each defense will be facing its toughest test yet in this game, and I expect there to be a lot of scoring in this contest. Oklahoma State is a great team, and is capable of winning this game, but I think in the end, Baylor finds a way to win and stay undefeated. Baylor 48, Oklahoma State 45. Big Game Guarantee: #12 Texas A&M (8-2) at #22 LSU (7-3). LSU is a 4-point favorite at home in a matchup of two of the SEC’s best offense. Texas A&M is led by QB Johnny Manziel, who won last year’s Heisman trophy, and may win it again this year (the only player to win it twice is Archie Griffin in 1974-75). The Aggies lead the SEC in points per game and yards per game, both by a wide margin. LSU’s offense is likely their best under coach Les Miles, led by QB Zach Mettenberger. For LSU to keep their streak of 10-win seasons alive (every year since 2009), they will have to beat Texas A&M and Arkansas and then win their bowl game. In the end, however, Manziel and the Aggies offense will be too much. LSU will keep the game close, but “Johnny Football” will lead his team to victory. Texas A&M 45, LSU 38. Another Big Game Guarantee: #17 Arizona State (8-2) at #14 UCLA (8-2). UCLA is a 2-point favorite at home in Pasadena, although Arizona State comes in having won 5 straight, including wins against Washington, Utah, and Oregon State. The only losses for the Sun Devils came early in the season to Stanford and Notre Dame. UCLA’s two losses came to a pair of top 10 teams, Oregon and Stanford, although the Oregon game was tied at halftime, and Stanford led just 3-0 at the half. UCLA plays their home games at the Rose Bowl, which is ironic, as both teams need a win to keep alive their chances of playing there on January 1. If the Sun Devils win they will clinch the Pac-12 South, and if the Bruins win, they will stay alive and could clinch with a win next week against USC. Both teams’ offenses should perform well in this game. I believe, considering UCLA’s only losses are to top 10 teams Oregon and Stanford, that they are better than most of us are giving them credit for. UCLA 41, Arizona State 35. Upset of the Week: #8 Missouri (9-1) at #24 Ole Miss (7-3). Missouri needs to win their last 2 games to win the SEC East, and they are favored by 3 on the road in Oxford. South Carolina, who has finished their conference schedule, will be finished with their bout with Coastal Carolina in plenty of time to watch and cheer on the Rebels, as they clinch the East in the event of a Missouri loss. If the Tigers win, this scenario will repeat itself next week when Missouri plays Texas A&M (although South Carolina’s game will just 45 minutes earlier next week). As for the game itself, Ole Miss has outgained Missouri, but Missouri has outscored the Rebels this season. Missouri is 2-1 this year against ranked opponents, with the loss in double overtime against South Carolina. However, the other two ranked teams Missouri defeated, Georgia and Florida, were both depleted by injuries, and have since fallen out of the rankings (Florida has to beat #2 Florida State just to make a bowl game). Ole Miss is 1-2 against ranked opponents, but one of their losses was at #1 Alabama. The other loss was by just 3 points to Texas A&M, their only home loss this year. The win came against LSU, 27-24, on October 19, and the Rebels haven’t lost since. A question for Missouri is QB James Franklin, who returns after missing 4 games with a shoulder injury. Ole Miss is a program that is on the rise, a rise that I believe includes a win in a big game like this one. Ole Miss 31, Missouri 28. Closer than the Experts Think: #19 Wisconsin (8-2) at #25 Minnesota (8-2). Wisconsin is favored by 16 points, on the road, against an 8-2 Minnesota team that has won 4 straight. This is a spread I don’t understand. I do understand why Wisconsin is a favorite, considering their record, with their only losses to Ohio State and Arizona State. They haven’t even been threatened by anyone else. Multiple analysts project they will be in a BCS bowl game, as an at-large bid, implying they would win out and reach the top 14 in the rankings. Minnesota struggled early in the season, losing to Iowa and Michigan. Coach Jerry Kill missed the Michigan game after suffering a seizure, and has taken a leave of absence since. Perhaps that is what has ignited this team, as they haven’t lost since, winning 4 consecutive Big Ten games for the first time since 1973. Both teams still have a shot at their respective division titles, although they would need help from the opponents of the teams they are chasing (Wisconsin is chasing Ohio State; Minnesota is chasing Michigan State). I believe these two teams are fairly even, although Wisconsin has just a little better rating in the “eyeball test”. Wisconsin 31, Minnesota 27. Bonus NFL Pick: Manning vs. Brady XIV, Denver Broncos (9-1) at New England Patriots (7-3). The Broncos are favored by 2 in Foxborough. Both teams are coming off of big games last week, although with different results. The Broncos beat the Chiefs 27-17, handing them their first loss of the season. The Patriots lost to the Panthers, 24-20, on Monday Night Football, with a disputed no-call shrouding the game’s final play in controversy. The two greatest QBs of the current era, Peyton Manning and Tom Brady, meet for the 14th time in this contest. Brady has won 9 of the previous 13, including 7 out of 9 in New England, and the Patriots won last year’s meeting, 31-21, which was also in New England. This year, however, the Broncos are considered by most to be the best team in the NFL, and Manning on pace to have a record-breaking season. In addition to the Manning-Brady storyline, there is also the storyline of Broncos WR Wes Welker’s return to New England, where he played from 2007-2012. While the Broncos likely have the better offense for now, the Patriots defense is also depleted by injuries. Expect the Broncos offense to jump on those defensive weaknesses. Broncos 38, Patriots 27. 1. Alabama (10-0). The Tide defeated Mississippi State, 20-7, on Saturday, but the game may have been a scare to some of the Alabama faithful. Alabama led 10-0 in the 3rd quarter, when the Bulldogs scored to make the score 10-7. The Tide answered with a touchdown and a field goal to eventually win by 13. The Tide now play Chattanooga, an 8-3 FCS team, in what should be a light test leading into the Iron Bowl on November 30 against Auburn. Auburn’s miracle (see below) kept alive the Tigers’ chances of an SEC West title, meaning that whoever wins the Iron Bowl will win the West. Forget a berth in the national title game; Alabama isn’t guaranteed to win their division yet, and if they do, they will still have to win the SEC Championship game to get to Pasadena. 2. Florida State (10-0). The Seminoles won by a 59-3 score for the second consecutive week, this time victimizing Syracuse. Duke’s big win over Miami may have made Florida State’s road even easier, as they now won’t have to face Miami again unless Duke is upset sometime in the next two weeks (not that I think Miami would beat them, if given the chance, but it’s always tougher to beat a team in a second meeting in a season). Florida State is favored by 57 points against Idaho, which is the largest spread I remember seeing all season, and Idaho isn’t even an FCS opponent (they are a member of the FBS, playing as an independent, with a 1-9 record, although they did lose by just 10 to undefeated Northern Illinois). After their game with Idaho, they will go to “The Swamp” to play Florida, before a trip to Charlotte for the ACC Championship game. I would be absolutely shocked if the Seminoles aren’t in the National Championship game on January 6. 3. Baylor (9-0). The Bears easily stayed undefeated with a 63-34 win over Texas Tech, although they did trail briefly, early in the game. Those 34 points scored by the Red Raiders are the most points allowed by Baylor all year, although they were naturally offset by the Bears’ 9 touchdowns. While the Bears continue to impress, particularly on the offensive side of the ball, they will face their biggest test this week with a trip to a top-10 opponent when they play Oklahoma State. While a national title is certainly a possibility for Baylor, they haven’t even won the Big 12 yet, and this matchup with the Cowboys will go a long way towards determining who will get the conference’s automatic BCS bowl bid. Even if the Bears can leave Stillwater with a win on Saturday, they will still have to play TCU and Texas in regular season play (the Big 12 has no title game) before they can think about playing for a national title (and they would also need some help ahead of them from not 1, but 2 teams, since they are 4th in the BCS, where it counts). 4. Ohio State (10-0). On the field, on Saturday, the Buckeyes stayed undefeated with a 60-35 road win over Illinois. Off the field, the Buckeyes made headlines on Monday, after coach Urban Meyer called the BCS a “flawed system.” Sorry coach, but out of the 4 undefeated teams in BCS conferences, you and your Buckeyes have played the weakest schedule, and have played the closest games. Although the Buckeyes are currently 3rd in the BCS rankings, they may fall behind Baylor if the Bears win out, so they likely need 2 out of my top 3 to lose at some point if they want to play for a title. The Buckeyes have games left with Indiana, at home, and Michigan, on the road. While they are heavily favored against Indiana, the Michigan game is certainly a game the Buckeyes will have to play well to win. If they win just 1 of those 2 games, they will then play the Big Ten Championship game, likely against Michigan State. 5. Oregon (9-1). The Ducks led Utah just 17-14 at one time in the 3rd quarter on Saturday, before scoring 27 straight points and eventually winning 44-21. This was their first game since their national title hopes likely ended with a 26-20 loss at Stanford. The Ducks are done with matchups against ranked opponents, at least until a potential Pac-12 Championship game, but still play 2 good teams in Arizona and Oregon State. If they win those 2 contests, they will clinch the Pac-12 North division title, and will play either Arizona State, UCLA, or USC in the conference title game. The Pac-12 title game is unique, at least among the BCS conferences, in that it takes place on the campus of the team with the better record. Therefore, that potential title game would likely be on Oregon’s campus (this hasn’t been clinched yet, but may be soon). They wouldn’t be in this position, considering their loss to Stanford, without Stanford’s loss to USC. 6. Auburn (10-1). Auburn found a way to win Saturday, winning what CBS’s Gary Danielson called the “Miracle by Marshall”, 43-38, in one of the SEC’s all-time greatest games. Auburn led 37-17 early in the 4th quarter, before Georgia QB Aaron Murray led 3 straight touchdown drives to give the Bulldogs a 38-37 lead with 1:49 remaining. The Tigers were facing 4th and 18 when QB Nick Marshall threw the ball deep, toward WR Ricardo Louis. A Georgia defender, Josh Harvey-Clemons, deflected the pass, which went straight up after the tip. When it came down, Louis caught it in the open field and scored to give Auburn a 43-38 lead with 25 seconds left. Murray led the Bulldogs back inside the Auburn 25 yard line, but time expired and the Tigers had won the best game I’ve seen all year in football, maybe in any sport. Now Auburn has a bye, giving them an extra week to prepare for top-ranked Alabama, who they will host in the Iron Bowl on November 30. The matchup will be for the SEC West title, making it the first time since 1994 that both teams can win the game to win the division. 7. Clemson (9-1). Clemson fans will always say the Georgia Tech game is one that worries them, as the series tends to always produce close games, regardless of rankings and records of the two teams. This year was an exception, as the Tigers took care of business on Thursday night, winning 55-31. Clemson ranks 12th in points per game, but that’s with 3 games in which they were held to 26 points or less. Looking at their other games so far, it is clear they have one of the nation’s most explosive offenses. In their last 3 games, the Tigers have scored 40, 59, and 55 points. This week should be an easy win for the Tigers, as they host a 5-6 FCS foe, The Citadel, in preparation for a showdown against South Carolina in Columbia on November 30, in a game that could be an elimination game for a BCS at-large berth. 8. Missouri (9-1). The Tigers move up during their bye week, passing Stanford after their loss. Missouri leads the SEC East, and controls their own destiny, but if they want to play in Atlanta on December 7 against the Alabama/Auburn winner, they will have to win two tough games first. This week, the Tigers will travel to Ole Miss. The Rebels have only lost once at home, by just 3 to Texas A&M, and beat LSU at home on October 19. After Thanksgiving, the Tigers will host Johnny Manziel and the Aggies of Texas A&M. Starting QB James Franklin is scheduled to start on Saturday against the Rebels, although some are skeptical of his effectiveness coming off a 6-week break from action with a sprained shoulder. By the way, freshman QB Maty Mauk, who replaced Franklin (remember we all said he couldn’t win against Florida, South Carolina, etc.) was 3-1 as a starter, with the loss coming in double overtime to South Carolina. 9. Oklahoma State (9-1). The Cowboys (of Stillwater, not Dallas) make their first appearance in my rankings this season, following a big 38-13 win at Texas, which gave the Longhorns their first conference loss. To put their season so far into a nutshell, the Cowboys have pretty much blown out all of their opponents, with two exceptions. First was their only loss of the season, which was a September 28 upset loss at West Virginia, 30-21. The following week was their only close win of the season, in a 33-29 victory over Kansas State at home. The Cowboys are 14th in the nation in both points scored and points allowed, having scored 52 or more on 4 occasions this season, while allowing 13 or less 5 times. Some may question their strength of schedule, as they’ve beaten just 2 teams who were ranked when they played, and both teams (Texas Tech, Texas) have since dropped from the rankings. However, their 2 toughest games of the year will be their final 2 regular season contests. This week, the Cowboys will host Baylor, in a matchup of top-1o teams. The winner of this game will control their own destiny in the Big 12 race. On December 7, the Cowboys will play the “Bedlam” rivalry game against Oklahoma, at home. 10. Stanford (8-2). Stanford was upset Saturday night by USC, losing 20-17 at the Coliseum in Los Angeles, and now they fall from 5th to 10th in these rankings. This was the second time this year the Cardinal have been upset, as they also lost at Utah on October 12. Stanford is a puzzling team, because while they’ve lost to two unranked opponents (although USC has since become ranked), they’ve also beaten 5 ranked opponents, including 2 top-10 teams, and another top-15 team (based on rankings at the time of the games). Both top-10 wins were convincing, beating UCLA 24-10, and Oregon 26-20 after leading 26-0. It is this strength of schedule that keeps them here in the top-10 with 2 losses, ahead of other 2-loss teams (particularly those in the SEC). In addition, their defense has not allowed more than 28 points in a game, despite playing in a Pac-12 conference that features a lot of offensive firepower. Also considered: South Carolina (8-2), Texas A&M (8-2), Michigan State (9-1), Northern Illinois (10-0), Fresno State (9-0), UCLA (8-2), UCF (8-1), Louisville (9-1), Oklahoma (8-2), Wisconsin (8-2), Minnesota (8-2), Duke (8-2). Fell from rankings: South Carolina (8-2, defeated Florida 19-14, but passed by Oklahoma State). Jimmie Johnson finished 9th in Sunday’s Ford EcoBoost 400 at Homestead-Miami Speedway, enough to comfortably claim the 6th NASCAR Sprint Cup Series championship of his career, all of which have come in the last 8 seasons. 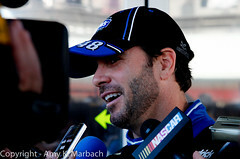 His 6 championships place Johnson just 1 title short of the record of 7, shared by Richard Petty and Dale Earnhardt. While breaking that record is likely one of Johnson’s career goals, he has a legitimate shot at winning 10 titles in his career. Johnson won the title by 19 points over Matt Kenseth, the 2003 Cup Series champ in his first year for a new team, Joe Gibbs Racing. Kenseth ran well, leading the most laps and finishing 2nd, but when Johnson finished the race without issue, the 28-point deficit at the start of the day was insurmountable. Kevin Harvick, who still had a mathematical chance at the title at the start of the day, finished 34 points back after struggling most of the day before rallying to a 10th place finish. The top 5 in the standings were rounded out by Kyle Busch and Dale Earnhardt Jr. The title is the 11th for Hendrick Motorsports, adding to an all-time record which already exists. As mentioned, Johnson has won 6 titles in the last 8 seasons (by the way, that’s never been done before; Earnhardt won 6 in 9 seasons from 1986-1994), all with Hendrick. In addition, Jeff Gordon’s 4 Cup Series titles (1995, 1997-98, 2001) are all with Hendrick, and 1 of Terry Labonte’s 2 titles came for Hendrick (1996). Sunday’s title for Johnson adds to Hendrick’s already historic career. First I figured up that Hendrick has won 11 titles in his 30 seasons in the Sprint Cup Series, which is true. But when analyzing the titles, I realized that all of the 11 are in the last 19 seasons, an unbelievable feat. Kenseth’s runner-up finish was behind Denny Hamlin, who grabbed his first victory of an otherwise dreadful season. Hamlin broke his back in March in an accident while racing for the win at the Auto Club Speedway. He returned at Talladega, but ran only 23 laps before being relieved by Brian Vickers, before finishing 2nd the following week at Darlington. After that, however, Hamlin was continuously nagged by accidents and bad breaks. Hamlin’s win continued a streak of winning a race in each of his full-time Sprint Cup seasons, now 8 in a row. Dale Earnhardt Jr. finished 3rd in the race after leading some laps in the second half of the event. Martin Truex Jr. was the best among those in their final ride for their current teams, with a 4th-place finish. Truex will be moving to Furniture Row Racing next year after his current team, Michael Waltrip Racing, was forced to let him go after losing NAPA’s sponsorship. Kevin Harvick, who, as mentioned, finished 3rd in the standings and 10th in the race, will leave Richard Childress Racing after 13 Sprint Cup seasons for Stewart-Haas Racing. Ryan Newman finished 17th in his final ride for Stewart-Haas Racing, and will drive for Richard Childress Racing next year. Kurt Busch ended his only season at Furniture Row Racing with a 21st-place finish, as he prepares to drive for Stewart-Haas Racing in 2014. Others either took the track for the final time on Sunday, or face an uncertain future. Mark Martin finished 19th and Ken Schrader finished 34th, both in their final race in the Sprint Cup Series due to emending retirement. Juan Pablo Montoya ended a 7-year NASCAR career with a 18th-place finish. Montoya isn’t retiring, but instead moving back to the IZOD IndyCar Series, trying to duplicate success he had in open-wheel racing in both Indy and Formula-1 earlier in his career, including an Indianapolis 500 win in 2000. Jeff Burton finished 23rd in his final race for Richard Childress Racing, and Dave Blaney finished 38th in his final race for Tommy Baldwin Racing. Both veterans are unsure of their futures in the sport at this time, as well as Bobby Labonte, whose replacement for next year at JTG Daugherty Racing, AJ Allmendinger, drove the team’s car on Sunday. Johnson wasn’t the only champion this weekend in South Florida. Austin Dillon won the Nationwide Series championship, and Matt Crafton won the Camping World Truck Series title. Dillon is the grandson of Richard Childress, and drives #3 to honor both Childress (who drove the number in the 1960s-70s) and Dale Earnhardt, who made the number both famous and symbolic. Dillon won the 2011 Truck Series title, in his 2nd season in the series, at age 21. Now 23, Dillon won the Nationwide title in his 2nd season in the series. Dillon will move to Sprint Cup in 2014, and will be the first to drive #3 in the Cup Series since Earnhardt’s death in 2001. Should he continue the trend of winning a title in his 2nd season in each series, he would match the record of, you guessed it, Earnhardt, who won a title in his 2nd season in 1980. Dillon won by just 3 points after a season-long points duel with former IndyCar champion Sam Hornish Jr. Crafton is a 13-year Truck Series veteran, having driven his whole career for ThorSport Racing. He has 3 career wins in the series, including one in April at Kansas Speedway. Consistency is what won Crafton the title, as he finished in the top 10 in the first 18 events of the season, and had a season-low finish of 18th, which is remarkable over the course of a whole season. Crafton’s consistency is a trademark of his career, as he has finished in the top 10 in 175 out of his 316 career starts. Crafton clinched the title simply by starting the finale on Friday night. I was privileged to watch Sunday’s race in the High Octane Theater inside the NASCAR Hall of Fame in Charlotte. A friend of my aunt gave her 2 tickets for this race viewing party. We watched the race on the big screens, which featured the ESPN broadcast (but without commercials!) as well as on-board cameras for Jimmie Johnson and Matt Kenseth. The Hall also provided race scanners, which allowed us to listen in on the radio channels used by the drivers to communicate with their crews and spotters. While Johnson and Kenseth would have been two interesting drivers to listen to, given the championship battle, I figured ESPN would keep us updated on anything interesting being said by those two, so I kept my scanner on Jeff Gordon’s channel for most of the race. He is, after all, my personal favorite and was also my pick to win the race in a fantasy league I play with a friend and his family. The highlight of the day, however, was meeting 2011 NASCAR Hall of Fame inductee Ned Jarrett. He was making an appearance at the hall to unveil a car, which will be put on display in the coming weeks, that he drove in 1966, the year he retired midway through the season. Jarrett is the only driver to retire as the reigning Cup Series champion, having won the title in 1965, as well as one earlier in 1961. After completing his driving career in which he won 50 races, he began a career as a racing broadcaster, first for MRN Radio in 1978, before joining CBS and ESPN from the late 1980s to the late 1990s. His most memorable moments as a broadcaster are clearly being in the booth for a handful of wins by his son, 2014 Hall of Fame inductee Dale Jarrett: his first win in 1991 at Michigan, and his first two Daytona 500 wins in 1993 and 1996. Jarrett, following the unveiling of the car, answered questions from fans, before taking pictures with those, like me, who became Hall of Fame members on Sunday. I was going to include a couple of prominent NFL games at the end of my college football picks for this week, as I’ve done a couple of times for some of the bigger NFL games throughout the year. However, I ran out of time to write the extra material for these games. Therefore, here are my picks for the 3 big NFL games of the weekend. Kansas City Chiefs (9-0) at Denver Broncos (8-1). The Broncos are probably the NFL’s best team, and are favored by 8 at home. The Chiefs, after a 2-14 record a year ago, are the last undefeated team in the league. While that fact is absolutely remarkable, considering where the Chiefs were at this time last year, the Chiefs have not beaten a team who currently has a winning record. The best record of a team they have beaten is 5-5, shared by the Cowboys and Eagles. In addition, 4 of their 9 games were decided by single digits, with 2 more being decided by exactly 10. The Broncos have the best offense in the NFL, and are on pace to have one of the best in history, on the strength of 353.4 passing yards per game. Peyton Manning is having one of his best seasons, even at age 37. The Broncos have pulled off big win after big win, and have only played 2 close games, against the Cowboys and Chargers, in addition to their loss to the Colts. The key matchup will be between that Broncos passing attack I mentioned and the Chiefs secondary, which ranks 6th in the NFL. This is the game of the year, at least so far, in the NFL, and one of the best home crowds in the NFL will be in it, for sure. Broncos 38, Chiefs 28. New England Patriots (7-2) at Carolina Panthers (6-3). The Panthers, playing their first Monday Night Football home game since 2008, are 2 point favorites. Carolina is coming off of a big road win against the defending NFC Champions, the San Francisco 49ers, and sit a game back of the Saints in the NFC South. They also hold the first NFC Wild Card spot, and would be the NFC’s 5th seed if the playoffs started today. That’s not bad for a team that hasn’t had a winning record in 5 years. The Patriots, on the other hand, haven’t had a losing record in 13 years, and that streak is likely to continue this year, as they sit at 7-2, with a comfortable lead in the AFC East. They are coming off a bye, and in the game before the bye scored the most points ever scored against the Steelers, and also gained the most yards ever gained against them. While the Patriots are known for their Tom Brady-led offense, the Panthers are very quietly posting a solid year defensively, ranking 2nd in rushing defense, and 5th in passing defense. New England will be traveling into a fan base that is hungry, and will likely make some noise for the biggest Panthers home game since the 2008-09 NFL Playoffs. Panthers 24, Patriots 20. San Francisco 49ers (6-3) at New Orleans Saints (7-2). The Saints, who are undefeated at home, are hosting this matchup of NFC playoff contenders, and is favored by 4. The 49ers opened the year with an impressive win over the Green Bay Packers, before consecutive losses to the Seahawks and Colts. After that, they won 5 straight games, a streak that ended last week with a 10-9 loss to the Panthers at home. While the 49ers record isn’t bad, if you take out the Packers win the best team they’ve beaten is the Cardinals. The Saints began the year 5-0, but are 2-2 in their last 4 games. Last week, however, they defeated the Dallas Cowboys convincingly, 49-17, in a game in which they had an astounding 40 first downs. This will be a game of matchups. The Saints passing offense and the 49ers secondary are both among the best in the league. The 49ers rushing offense is clearly their strength, as they rank 4th in rushing and 32nd (last) in passing, and will be facing a Saints rushing defense that ranks 23rd in the league. While I think the 49ers will have a lot of yards on the ground in the contest, I expect the Saints home-field advantage to continue, as Drew Brees continues to excel. Saints 35, 49ers 30.